Red-yellows, Canoneers, "Pryaniki" (Gingercakes), "Pushkari" (artillerymen), "Oruzheyniki" (Gunsmiths), Samovars. FC Arsenal Tula (Russian: ФК «Арсенал» Тула) are a Russian football team from Tula playing in the Russian Football Premier League. Originally founded in 1946, FC Arsenal Tula were promoted to the Russian Premier League in 2014 for the first time in their history after finishing as runners-up in the 2013–14 Russian National Football League. This achievement marked three successive promotions for the club. On their debut season in the 2014–15 Russian Premier League, they finished in last place and were relegated back to the FNL. The club spent one season in the FNL before returning to the Premier League for the 2016–17 season, which they have competed in ever since. The team currently plays their home games in Arsenal Stadium, which has a capacity of 19,241. Arsenal Tula played their first season in the USSR Championship in 1946 under the name Zenit Tula, competing in the Central Division of the RSFSR Championship and finished 5th in their debut season. The precursors to Arsenal Tula played mainly in the Soviet Second League and never played in the Soviet Top League. The club was the champions of Zone West of the Russian Professional Football League in 1997 and 2003 and competed in the Russian Football National League from 1998 until 2001 and in 2004. In 2005, Arsenal Tula did not receive an FNL license due to financial difficulties and once again competed in Zone West in the PFL. 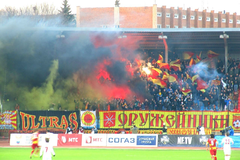 In 2006 the team FC Arsenal Tula was liquidated and FC Oruzheynik Tula was formed in its place, playing in the Amateur Division. In 2011, it was announced that the team FC Arsenal Tula would be reformed. The present day team FC Arsenal Tula was formed at the end of 2011, replacing the former team FC Arsenal-Tula. The first coach of Arsenal was the famous Russian footballer Dmitri Alenichev and the coaching staff included Dmitri Ananko, Oleg Samatov, and famous goalkeeper Aleksandr Filimonov. The club's initial squad also had several famous players such as midfielder Yegor Titov and defender Dmytro Parfenov. Over the course of the 2011/12 season, Arsenal finished in 8th place in the Russian Amateur Football League and all of the famous footballers left the club. Trainer Dmitri Alenichev decided to replace them with young players. On June 18, 2012, Arsenal received a license to compete in Zone Center in the 2012–13 Russian Second Division. Arsenal won promotion at their first attempt, finishing the season with 73 points and 22 wins, 7 draws, and just 1 loss. In the 2013–14 season, FC Arsenal Tula were promoted once again, finishing as runners-up and being promoted to the Russian Premier League for the first time in their history. Over the course of the 2014–15 Russian Premier League, Arsenal finished in last place with 25 points and were relegated back to the FNL. During this season, on April 9, 2015 Arsenal had a sensational 1-0 victory over Spartak Moscow. In this match, the fans of Spartak climbed onto the roof of Arsenal Stadium despite it being unsafe and one fan was hospitalized. This match resulted in the club being fined 500,000 rubles and being forced to play their next match against Krasnodar at a neutral venue. In the 2014–15 Russian Cup, Arsenal reached the quarterfinals, beating Zenit Saint Petersburg in their home stadium. Before the beginning of the 2015–16 season, trainer Dmitri Alenichev left for Spartak Moscow and was replaced by Viktor Bulatov. Viktor Bulatov was sacked after 24 games, with the club having won 14, drawn 4, and lost 6 games under his tenure. Bulatov was replaced by Sergei Pavlov, who led Arsenal back to the Premier League, with the club finishing as runners-up with 82 points. In the 2016–17 Russian Premier League, Arsenal started poorly, and in October 2016, Pavlov was sacked and replaced with Sergei Kiriakov. Arsenal finished in 14th place and advanced to the relegation play-offs against Yenisey Krasnoyarsk, which Arsenal survived and stayed in the Premier League because of the away goals rule, as Arsenal had won 1-0 in Tula and lost 2-1 in Krasnoyarsk. In the 2017–18 season Arsenal hired Miodrag Božović, who led them to their highest ever position of 7th in the Premier League. As of 11 February 2019, according to the official website. Note: Flags indicate national team as defined under FIFA eligibility rules. Players may hold more than one non-FIFA nationality. Traditionally, the games of Arsenal have drawn great interest from the local football loving population. In the 2011-12 season, when Arsenal was still an amateur team, over 13,500 fans showed up for a match between Arsenal and Rusichi, which is an attendance record for a Russian amateur game. 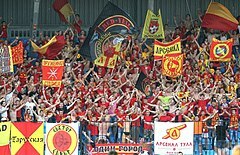 In the second division, FC Arsenal Tula's attendance was over 8,000 people on average. According to data collected by the Russian Football Union in 2013, Arsenal's attendance was 15th out of 106 professional clubs in Russia.. In the FNL, the average attendance of Arsenal was 10,844, with over 16,500 people showing up for the key game against Torpedo Moscow. In Arsenal's first season in the Premier League, the average attendance was 12,154. There are several ultras groups among Arsenal fans including the well-known Red-Yellow Cannoneers.. The shirt number 12 has been permanently retired by the club management in honor of the fans. Arsenal's feeder club Arsenal-2 Tula participated in the third tier of professional Russian football, Russian Professional Football League, beginning with the 2014–15 season. The club was dissolved after the 2016–17 season. Another team was called Arsenal-2 and competed professionally from 1998 to 2002, it last competed as Dynamo Tula. Had international caps for their respective countries. Players whose name is listed in bold represented their countries while playing for Arsenal. ^ "стадион Центральный стадион «Арсенал»". premierliga.ru. Retrieved 16 December 2018. ^ «Арсенал» возвращается в Премьер-лигу! (in Russian). Russian Football National League. 10 May 2016. ^ "Возрождение тульского «Арсенала»" (in Russian). Tula Oblast Committee on Sport and Youth Politics. 27 October 2011. Archived from the original on 5 August 2012. Retrieved 25 July 2012. ^ "На матче «Арсенал» — «Госуниверситет-Русичи» установлен рекорд первенств Черноземья по посещаемости" (in Russian). tula-football.ru. Archived from the original on April 4, 2013. Retrieved March 29, 2013. ^ "30 самых посещаемых футбольных клубов России" (in Russian). sports.ru. Archived from the original on June 24, 2013. ^ "Интервью представителя фанатского движения Red-Yellow Cannoneers". russian-ultras.com. Archived from the original on April 4, 2013. Retrieved March 29, 2013. ^ Тульский «Арсенал-2» расформирован, фарм-клубом «Арсенала» стал новомосковский «Химик». Tula Football. 7 June 2017. This page was last edited on 28 February 2019, at 07:43 (UTC).